See just what they summoned in the review below. In This Moment have been forging a path ahead which finds the band on their sixth release. Following the departure of long time drummer Tom Hane the band have come together for their latest offering. Inspired by the classic witches of Salem, Ritual was an apt title for the decision of their brand new album. Wanting to create more of a statement than ever done previously the band set out to record a brand new chapter. Immediately setting the tone with “Salvation” there is a definite air of the cinematic hooking you in from the word go. Heading straight into the Blues influenced “Oh Lord” stripping back the more Metalcore aspect of the band it’s possibly the most simplistic the band have sounded and ties in with later track, again with a Blues influence “River of Fire“. Aside from the guest spot of Rob Halford there are some really neat parts in “Black Wedding” where the band make a great use of the more electronic element to create an unorthodox style breakdown being sleek instead of rather clumsy works brilliantly. Not to mention a far darker rendition of the Phil Collins classic “In The Air Tonight” which would have less Cadbury monkey and more Steampunk chimpanzee with its set piece not being the drums but instead Brink’s brilliant vocals! Though the albums definitely most poignant moment is in the form of “Lay Your Gun Down” the songs final track. A simple but effective ending that lasts long after its finished and tied in brilliantly with how the record starts back up. The conceptual centrepiece lies with “Witching Hour” where one of the many intro’s bring us into the witch trials era. Though the music is more of an electronic nature, Brink’s delivery reminds me almost a more alternative, malevolent Lady Gaga. As the album moves forward it takes more of melancholy stance particularly “Twin Flames” recalling more of a sadness, adding real depth to the band. The album does have an electronic slant on “Roots” which is far more dystopian than it’s more Blues counterparts. Putting more intent into a concept that shows a darker, more mature theme. With Ritual, In This Moment have created a record which is a far deeper than what they have done previous. Experimenting with different styles whilst retaining their signature sound it’s an interesting take, for the cover of Phil Collins alone! There’s plenty of surprises to be had on Ritual. 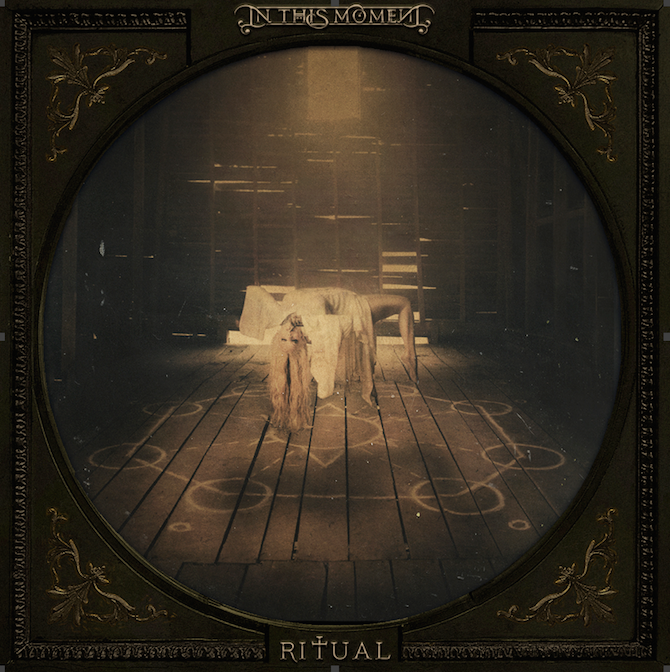 Ritual is out now via Roadrunner / Atlantic Records. You can pick up a copy if you like what you read / heard here!